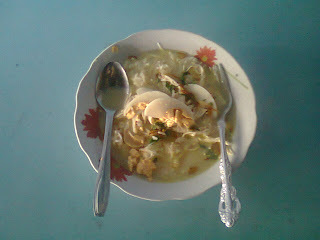 Soto Banjar is famous soup culinary in South Borneo, If you read information in Lonely Planet about a must taste culinary in Banjarmasin city, you may read that Soto Banjar is one of the culinary that people recommend. This is my mother soup, she sells Soto Banjar in her warung (food stall), if you come to Banjarmasin, take a look of his cooking. I love it sometime.